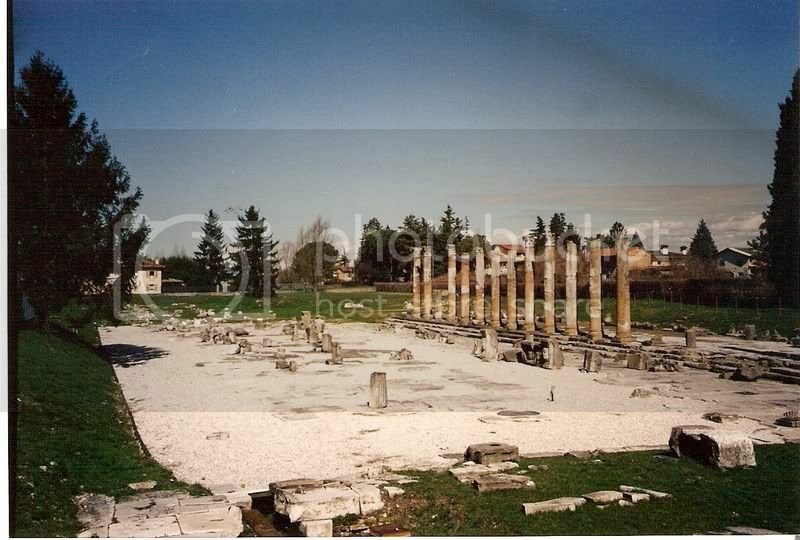 Aquileia was one of the most important towns of northern Italy having been established as early as 180 BCE. The three principle cities of the Roman triumvirant were Aquileia, Carnia and Cividale. Aquileia was situated on the Natissa River about 8 miles north of the Adriatic sea and since it was the starting point for travel into the northeast regions toward the Alps, it grew into an important center for trade. Many Roman roads converged there and a substantial river port grew for transporting goods north and southward by way of the sea. By the third century CE, Aquileia had a population of 100,000. It survived an invasion by Alaric's Vandals in 401 and was susequently completely destroyed by Attila in 452. Actually, according to legend, Attila remained in Udine during the seige of Aquileia where he ordered his troops to erect a mountain upon which he could stand and watch Aquileia burn. To this day, it is possible to stand on this "out of place" hilltop in the heart of Udine, said to have been built from dirt scooped up in soldiers helmets. It is said, that the citizens who fled during the seige, later established near-by Venice, which of course became famous in its own rite. Many, many impressive sights exist at Aquileia and archeaological work continues there to this day. The cathedral is very impressive, with the second largest tile mosaic floor in the world uncovered and discovered by accident when repairs were being made on the floor which covered it over. The remains of the Roman port, the Roman city and the roads are open for public viewing, though little remains except the foundations and floors. During the next few days, I will post some views from photos I have recently found.